As a child growing up, I heard sakhi after sakhi of Guru Nanak Sahib’s life – from his childhood, to his travels, to the odd conversations with various holy men – but for whatever reason, I connected with none of it. However, at the same time I was developing an interest in social justice and became fascinated with the life and works of activists like Dr. Martin Luther King Jr., Malcolm X and Nelson Mandela. I wasn’t interested in Sikh history…I was interested in revolutionaries. But when I was finally able to connect the two and learned about “Guru Nanak The Revolutionary”, it all made sense…and I was hooked! To this day, there is not a shabad I hear from Guru Sahib’s baani that doesn’t challenge me to rebel. Every way in which society was designed to suppress an individual, to limit their potential, to leave them powerless, Guru Sahib found a way to take the common man or woman – uplift them, empower them, and enable them with a connection to the Supreme, so they could ultimately challenge that very establishment that suppressed them. This is Guru Nanak the revolutionary…and it’s the Guru Nanak I know. But this time of year, the anniversary of his birth, is always unsettling for me. When I look around, I see a celebration – not of Guru Nanak the revolutionary, but a caricature of him…a portly pacifist who’s become the symbol of “inclusivity.” An old wise man who’s teachings have been replaced with our own anecdotes and opinions. The image below making its way around the internet is symbolic of this. Where did this quotation come from? 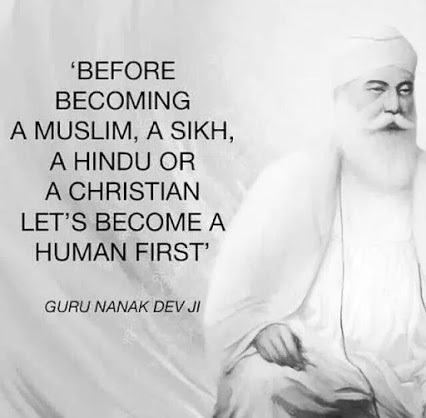 This #gurpurb let’s practice some independent thought, and not digest a quote simply because it’s cute & someone put it beside an artist rendition of what Baba Nanak might have looked like. I don’t know who put those words together, but they weren’t Baba Nanak. Refuting this quotation doesn’t take away from Sikhi’s universal message or seeing the “one-ness” in all of humanity. But if there is one clear message I get from Guru Sahib’s baani, it is to follow your Guru and live his teachings…and we don’t need to hide from that. This post was inspired by Jaswant Zafar’s beautiful poem titled “Nanak.” Never has something that sounded so beautiful felt like such a hard slap to the face. Take a listen and spend the 4 minutes…you’ll be glad you did.